On March 27, 2018, one of Ghana’s budding and fearless journalists, Latif Idris, was brutally beaten to near death at the headquarters of the Ghana Police Service. The journalist, who works with the Multimedia group, was not beaten by thugs. He was beaten by police personnel, the same people he would have had to run to if he had been attacked by hoodlums. His crime was for doing his job as a journalist by asking police officers a question at a time the officers had been deployed to maintain law and order by dispersing a supposedly rowdy crowd. Surprisingly, to the police, the approaches for maintaining law and order on that day included the resort to physical violence against a harmless journalist. The vicious and shameful attack on Mr. Idris is not an isolated incident. 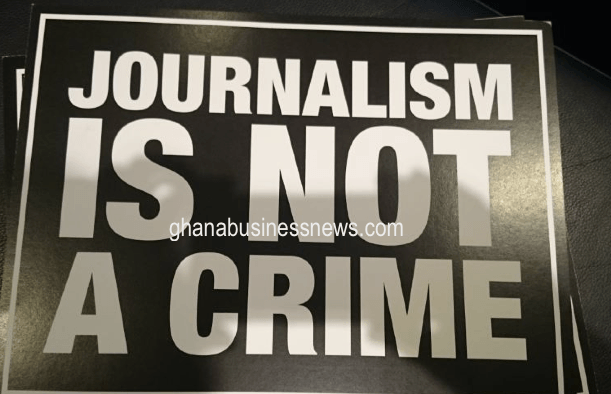 It adds to a tall list of 11 other incidents of attacks involving a total of 16 other journalists in Ghana in the last 15 months alone. Sadly, security agencies and especially the police have been along the leading perpetrators of attacks against journalists. Thus, the embarrassing attack on Mr. Idris, is a manifestation of deteriorating conditions of safety of journalists in a country that has had a positive press freedom record over the years. Prompted by concerns of a deteriorating press freedom environment in the country, the MFWA issued a statement in 2014 with a tall list of incidents of attacks and violations against journalists in the country. At the time, the MFWA warned that the country’s press freedom ratings could drop if authorities and stakeholders failed to end the rampant attacks on journalists. A year later, Ghana’s press freedom ratings dropped from being “Free” to “Partly Free”. February 27, 2017 – Kotoko Express Reporter Attacked: A photojournalist of the Asante Kotoko Expressnewspaper, GideonBotchway was subjected to physical abuse by a fan and a steward of Ashgold football club in Obuasi during a match between Ashgold and Asante Kotoko. March 5, 2017– Photo Journalist Attacked, Expelled from Stadium: Officials of Accra Great Olympics attacked a photojournalist, Senyuidzorm Adadevor, at the Accra Sports Stadium during the Accra Great Olympics-WAFA football match. March 6, 2017 – Soldiers attack a freelance journalist: Soldiers attacked a freelance journalist, Kendrick Ofei during Ghana’s 60th Independence Day celebration at the Independence Square in Accra. July 2, 2017 – TV3 Crew Attacked: A three-member crew from TV (Myepaul Sowah, Richmond Tanoh and Peter Asare were assaulted by some suspected land guards while investigating encroachment on a piece of public land at Teshie, Accra. July 3: Photo journalist Assaulted, Camera Destroyed: Some supporters of Asante Kotoko football club attacked a photojournalist with Hearts News,a bi-weekly published by Accra Hearts of Oak Football Club during a ceremonial match between the two clubs. The hooligans also seized the camera of the victim, Daniel Anane Boakye-Yiadom and destroyed it. October 10, 2017- Chief Assaults Journalist over WhatsApp Criticism: The Omanhene of the Wassa Akropong, Tetre Akuamoah Sekyim II,forced Larry Saint, a journalist with Rivers FM, to kneelin the sun for hours for criticizing him on WhatsApp. October 18, 2017 – Newspaper Office Attacked by Rampaging Youth: A group of irate youth calling themselves Kumasi Youth Assocaition (KuYA), attacked the regional office of the Daily Guide newspaper, in Kumasi Kumasi, over publications carried by the newspaper on Asantehene, Otumfuo Osei Tutu II. Dec 2, 2017 – Thugs Storm Radio Justice, Attack Presenter. Thugs stormed the studio of Radio Justice, based in Tamale, and assaulted the presenter of a programme and his three panelists, disrupting the live broadcast in the process. The attackers injured the presenter, Yunus Yiripha, and vandalized the console, microphones, computers and furniture. February 23, 2018 – Police Brutalise Journalist: Christopher Kevin Asima, a presenter of A1 Radio in Bolgatanga, was attacked by police while he was covering a fire outbreak incident. Sadly from all the incidents listed above and several others, no perpetrators have been punished. At best, the cases die with mere assurances of investigations by the police. Culture of Impunity for Crimes Against Journalists: Impunity for crimes against journalists has literally become the order of the day. Despite the several reported incidents of violations against journalists, punishment of perpetrators has been very rare, if any at all. This culture of impunity for crimes against journalists only emboldens perpetrators and encourages others to abuse journalists at the least opportunity. Many reported crimes go investigated or end with the mere pronouncement by the police to the effect that investigations have commenced. Indifference by state authorities: Authorities in the country have over the years failed to take a strong position against abuses on journalists. Indeed, not even petitions from advocates have succeeded in moving leaders of the country to openly condemn acts of violence against journalists. Lack of strong advocacy: Journalists Unions and media bodies have, over the years, not advocated strongly enough on safety of journalists. Disinterest and lack of solidarity among journalists: Journalists and media organisations have often failed to solidarise around matters of safety of journalists. When a journalist is attacked, the media often attaches no or less importance to the story. Elsewhere the media community see an attack on a journalist as an attack on the profession and all journalists for that matter and a collective and power action is taken to demand redress. Poor or lack of safety training for journalists: Majority of journalists in the country lack the basic knowledge and skills on safety and thus easily become victims of attacks. The majority of media organisations in the country also fail to train their journalists and do not have safety of journalists policies in place. Poor standards: Support from the general public is crucial for combating crimes against journalists. Unfortunately, there appears to be dwindling public support for journalists due to complaints of poor standards, partisanship among journalists, corruption, among others. The practice where abused journalists secretly take compensation from the their attackers and thus show no interest in advocacy for justice. The MFWA calls on all stakeholders to help address the above challenges as a matter of urgency in order to improve the safety of journalists’ conditions in Ghana.